How Did Digitization Come Into Existence? 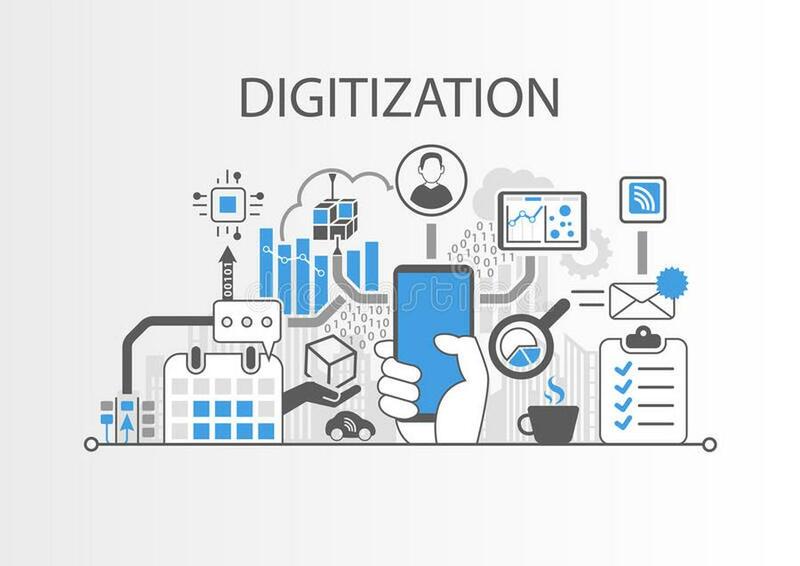 Digitization is the process of translating information into digital form and organizing it into separate units of data known as bits. The term “bit” is short for binary digit. It is the smallest unit of data used in a computer. It has a binary value of either 0 or 1. Half of a bit is called a nibble. A group of usually eight bits makes up a byte. The term “byte” dates to 1956 when engineers were working on an IBM computer system. Today computers are designed to store information and carry out instructions in bytes. While bit is abbreviated as “b” and byte is abbreviated as “B,” the capacity of computer storage is advertised in million bytes or megabytes (MB). Thus, a computer with storage of 560 MB can hold around 560 million bytes of data. A gigabyte (GB) is a billion bytes and a DVD-R disc has the capacity of holding 4.7 GB. Both written text and images, such as photos or drawings, can be scanned and converted into an image file. The advantages of digitizing information are that the information is easier to locate, store, share and retrieve. For example, decades ago, if people wanted to view the original Declaration of Independence, they would have to travel to Washington, D.C.. They would then wait their turn to enter the National Archives and Records Administration building where the original document is on display. Now that it has been scanned and converted to an image file, anyone anywhere in the world can view it on the Internet. Another advantage of digitization is the preservation of material. Physical books can deteriorate, especially those published during difficult economic times when lower quality paper and glue were used. Many institutions digitize their archives for this reason. Digitizing books is also somewhat of an “insurance policy” against fire or theft. Some books are hard to find or are out of print. But once they are digitized, they are much more accessible. Digital technology is currently being used in schools, from the kindergarten level to graduate school, with classroom learning being augmented with PowerPoint presentations. Learning at home is also enhanced by the ability to access more resources via computer. The PowerPoint presentations can also be shared with other schools around the country. Some schools in Arizona and Texas are replacing traditional textbooks with laptop computers. Penn State University has designed a files-sharing system that enables students to locate information possessed by other schools. The Massachusetts Institute of Technology offers its course material online. Of course, there are copyright issues involved in the sharing of digital information, specifically in passing it onward. These copyright laws help protect the author’s intellectual property and offer motivation to authors to create new works. Having one’s intellectual property taken and used without permission or compensation is not an incentive for an author to write more manuscripts. Google is currently working with a number of public and university libraries to digitize their collections, making them available to a wider audience. In addition, “orphan books”, this is, those whose author is unknown or unable to be contacted, are also included in the project. More than 10 million books have been digitized so far. This initiative started in 2006 and it is hoped that it will be completed by 2012. The oldest digital library is Project Gutenberg, a volunteer initiative that was founded in 1971 by Michael Hart. Hart used a mainframe computer at the University of Illinois. This computer was one of 15 computers that made up a computer network which eventually became the Internet. The majority of the collection consists of the complete text of a number of public domain books. In 1989, Project Gutenberg switched from manually entering text to scanning it into the computer via optical character recognition software and image scanners. How Do Businesses Transfer Paper-based Data Into Electronic Data? The regular or periodic transfer of paper-based data into electronic data is a common aspect of modern organizational practice. Electronic data can be stored in a far more compact manner than paper-based data and can also be more secure, particularly as paper records can be subject to physical damage. Unlike paper records, electronic data can also be accessed more easily and widely, both within an organization and remotely. Similarly, the data can be easier and safer to transmit utilizing such methods as encryption. In developing a system to manage the transfer of paper-based data into electronic form, organizations should ensure that they have policies covering the purpose and nature of paper-based data and what should be transferred into an electronic record in order to meet the organization’s current and potential needs. For example, an organization may wish to keep a digital record of particular hard-copy correspondence that is received or to make copies of records, reports or hard-copy publications available on its intranet or Web site. Stakeholders who may use or be affected by the transfer or existence of the data should be consulted, such as management, chief information officers, other staff, suppliers and customers. This consultation will help the organization to design a system that can be most effective in creating, capturing, maintaining, disseminating and disposing of the data. Organizations may have existing electronic data, and a decision will need to be made whether to integrate the paper-based data into the existing electronic data system or to develop a new system. If a new system is required, it should form part of the organization’s overall systems’ architecture to ensure that it mixes with existing and future information handling and technology capabilities. There will need to be appropriate technology in place to store the data securely, and the human resources of the organization will need to be adequate to manage the migration of the paper-based data to electronic format and to maintain and administer the data. To facilitate the transfer into electronic format, paper-based data may need to be arranged in a certain order, such as according to subject matter, chronology or type of material, and ancillary information about the data, such as its author, date of creation, etc., may need to be recorded. A policy should be developed governing access to the electronic data, such as who can read or edit records and what access conditions are in place. The actual transfer of the paper-based data can be done by a variety of means, ranging from manual entry of the data to scanning. Moreover, a large range of electronic data storage options is available for storing and managing electronic data, and each organization will need to assess which storage system best suits its needs. Issues to consider include the storage system’s versatility and capacity to accommodate the size, number and complexity of digital records to be stored and whether there is sufficient technical support for the system to improve the chances of forward capability. An additional issue to consider is the cost associated with the system, including costs relating to transferring paper-based records, maintenance of the data storage system, technical support and training. After the data has been transferred to an electronic format, a decision will need to be made as to whether the hard-copy materials should be retained, where they should be stored, the format in which they should be stored, who should have access and when and how they should eventually dispose of the material. How Does a Bank Go From a Paper-Based System to An Electronic One? Traditional banking systems are based on paper-driven human interactions involving physical documents such as hard currency, checks, deposit slips, bills and printed bank statements. By contrast, electronic banking – also known as Electronic Funds Transfer (EFT) – uses computer technology to provide automated services that can replace most paper-based transactions. Banks must be able to offer these services in order to compete in the current technological environment. Most banks now provide 24-hour access to Automated Teller Machines (ATMs), electronic terminals that allow customers to perform a variety of banking transactions by inserting a magnetized card and entering a preassigned Personal Identification Number (PIN). ATMs can be used to withdraw cash, make deposits, transfer funds between accounts and access account information. Most ATMs provide withdrawal services to customers of different banks, for which a processing fee is usually incurred. Direct Deposit is an electronic service by which customers can preauthorize the routine deposit to their accounts of payments such as paychecks, Social Security checks and tax refunds. This service also includes the preauthorization of direct withdrawals from the customer’s account for the automatic payment of recurring bills, such as mortgages, insurance premiums and utilities. Banks now offer increasingly sophisticated mobile phone-based and Web-based systems that allow customers subscribing to these services to issue remote instructions for the transfer of funds or payment of bills. Personal Computer Banking allows customer to access their accounts from their home computers in order to view their account balances and perform specific services. An increasing number of banks now allow their customers to perform purchase transactions with their debit card or check card – which may double as their ATM card – at point-of-sale transaction terminals located in stores and businesses, over the Internet or by phone. Unlike credit card transactions, this process transfers moneyimmediately from the customer’s account to the company’s account, so there must be sufficient funds in the customer’s account at the time of the transaction. Furthermore, liability for unauthorized use and customer rights regarding error resolution may differ between credit cards and debit cards. Another electronic service provided by banks is check conversion, which converts a paper check into an electronic payment in a store, or when a company receives a check in the mail. This is achieved by running the check through an electronic system that scans the information recorded on the check. The recipient then transmits this information to the bank, which transfers the funds to the recipient’s account. A typical bank will need to incorporate a basic set of common components or processes, which work together to deliver electronic banking services. These include Web site design and hosting, firewall configuration and management, network administration, an Internet banking server, e-commerce applications, programming support and automated decision-support systems. The overall system configuration for the various components of the banking system can vary greatly by deploying internal solutions for specific services and outsourcing others to third parties, such as Internet service providers, Internet banking software processors, managed security service providers, bill payment providers, credit bureaus or other banks or financial institutions that are already equipped to support such services. One of the most important issues confronting banks that seek to provide electronic services is that of security. Transactional Web sites routinely involve the electronic exchange of confidential customer information, which exposes the bank to significant risk. Wholesale electronic banking systems incur the highest risk, as commercial transactions can involve large amounts of money. Banks must be equipped to reduce these risks through security controls that safeguard customer details, authentication processes that verify the identity of customers accessing banking services and protocols for the assignment of liability for unauthorized transactions.